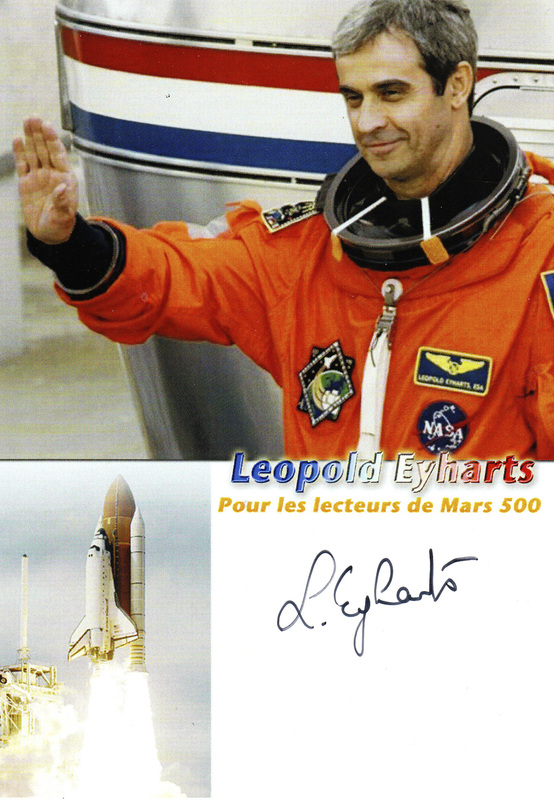 In 1990, Eyharts began his career at CNES joint to a path that will take him high, higher than fifty aircraft he flew, higher than the focused fighter planes and prototypes in which ventured to the safety of any other driver. Pilot test program manager of the CNES parabolic flight, then head of flight testing of the replacement of the parabolic Caravelle used previously, an Airbus A300 Zero G.
He finds himself in 1992 with the prospect of flying into space. But even for a seasoned man as he has to learn, again and again, and he will train in spaceflight (in Russia) and finally, 29 January 1998 Pegasus mission propels him to the Mir station as the chief astronaut mission and will conduct various experiments for three weeks. August 1998, is the other side of the Atlantic that is continuing his dream, at Johnson Space Center where he worked on projects for the ISS, he will wait ten years before they again behold the earth in all splendor. 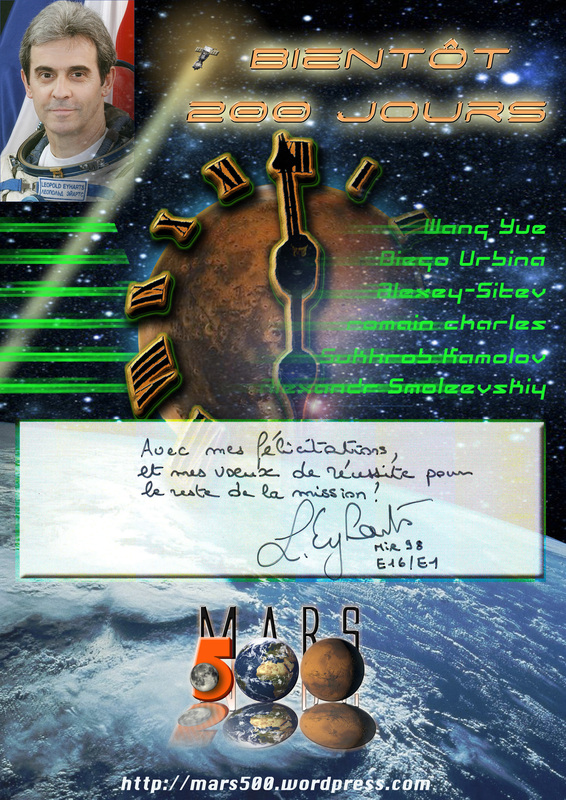 He will return to Earth after completing a mission of 48 days 4 hours and 54 seconds, time necessary for the installation of Columbus, on board the shuttle Endeavour. We are a small group of about fifty people, some children are in lot of these privileged we are, and we look forward to a delicious buffet, the coming of the famous astronaut. He arrives in the small hall, we shook hands, and soon we are in the privacy of a conference room with her, guided by Séverine and filmed by Sylvain, both CNES which we prepared this small evening we settle, and Leopold began after greeting the story of his major space project he led in 2008, the Columbus laboratory. Great speaker, he uses a language accessible to all children drink his words, and we listen passionately explain the mission STS 122, after which the questions pop up, many of us, and all have to ask, I for my part more than ten but I’m going to limit myself or get lynched by leaving those who have not had time to ask questions.Astronaut seeing all the arms are soft apologizes in advance, it will not expand too much on the answers to his great regret, for a few meters above the 200 other people also waiting for the second part of the evening or of course we are also invited. What do you think of the Mars 500 project? Eyharts: This mission is something important for space research, because here is the psychological environment of a small crew that takes precedence. I am wholeheartedly with them and wish them a lot of courage because it will not always be easy, but necessary to allow others to go farther. In the space station, they become atrophied organs? Can you feel the change? Eyharts: I do not know if they atrophy (hidden desire to laugh), what we feel is especially transfer fluids, blood and water from the body by gravity gives moreinflux in the face. You feel it especially in the sinuses, forehead and corners of the eyes, a sensation of severe cold, but we made it. The best and worst memory? Eyharts: The worse it was to postpone the mission each day for a month where we were sitting, ready to take off for hours, and lack of time it took too mild push. It’s hard because for us, strapped to the horizontal, this is not ideal, and the tension before being powered also has its share of stress. A good time was when we had dinner in the Japanese module, eat in space with chopsticks. In fact it is much easier than on Earth because your piece will not fall down, at worst, you let go, he is all alone! When will leave you for a future space flight? Eyharts: Very difficult to answer. The specifications for the ESA is already filled to 2020, there was a selection of 8 new astronauts, including our new French Thomas Pesquet, and there are fewer flights to the ISS planned that astronauts ESA. I think the new European astronauts should be entitled to their baptism. I would love to return there again, only this is not my call! Thank you very much Eyharts.